New iTunes gift certificate scam takes advantage of eager Black Friday shoppers, iPhone 4S to launch tomorrow in Colombia and India and December in Russia, while Apple releases its latest iPod touch TV commercial. As the holiday shopping season picks up, so do the number of phishing schemes preying on cash-strapped shoppers, the latest being a U.S.-targeted Black Friday email scam offering a fake $50 gift card from iTunes, according to the German language internet security blog Eleven. 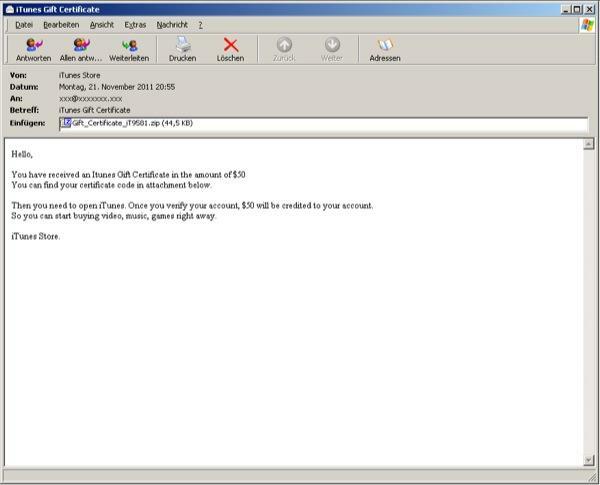 Affected users receive an email claiming to be from Apple's iTunes store, and are instructed to open an attachment that supposedly contains a certificate redemption code. The attached ZIP file is actually the malware Mal/BredoZp-B, which opens a backdoor on the affected computer allowing the software to pilfer passwords and other sensitive information. Colombia and India will be the next two countries to launch the iPhone 4S in Apple's continued worldwide rollout, while Russia joins Taiwan in an expected mid-December debut. The device is expected to go on sale in Colombia on Thursday at midnight and will be carried by local telecoms Movistar, Comcel and Tigo, according to Spanish language publication Elespectador. Although a media release from Movistar was first to announce the Colombian launch time, no carrier has revealed a price for Apple's newest handset. As reported by AppleInsider, India is also expected begin 4S sales tomorrow, with Airtel and Aircel both carrying the device at unsubsidized prices. Due to the popularity of pre-paid plans in the world's most populated country, many phones are sold unlocked and are subsequently more expensive than on-contract devices. 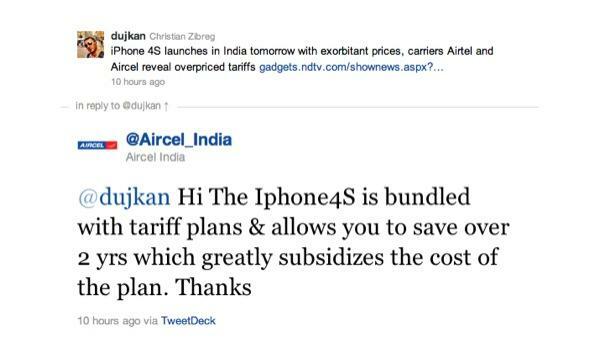 However, Aircel announced through Twitter that it will be offering the iPhone 4S in a bundled tariff plan that allows users to save money over a period of two years. Russia will reportedly join Taiwan in a mid-December launch, with major Russian cell phone retailer Euroset saying that the device will go on sale between Dec. 5 and Dec.21, according to Prime Business News Agency. Apple's latest iPod touch advertisement focuses on the new white model, which was announced alongside the iPhone 4S in early October, and highlights iOS 5 features like Facetime, iMessenger and integrated Twitter capabilities.